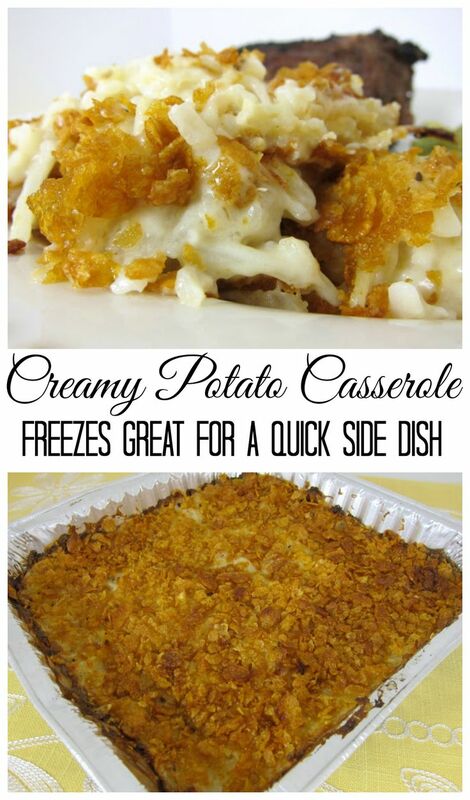 Creamy Potato Casserole - our favorite potato casserole! Frozen hash brown potatoes, chicken soup, mushroom soup, sour cream, top with crushed cornflakes. Great for a crowd/potluck. Freezes great for a quick side dish later! We call this potato casserole "Football Potatoes" because we love to serve it with a big fat grilled filet after a football game, but it would also be great for Thanksgiving this week. This might be our all-time favorite potato casserole. It is SO creamy and delicious. This casserole is not diet food by any means. It has cream of chicken and mushroom soup, sour cream and butter! I do use 98% fat free soup and light sour cream - every little bit helps! Since there are only two of us, I usually divide the mixture between three 8-inch foil pans and freeze two for later. It makes for a super quick side dish later! Mix all ingredients, except corn flakes and cubed butter. Spread into a lightly greased 9x13 pan. Top with crushed cornflakes and dot with cubed butter. I like the idea of dividing it and having them later. Sounds really good Steph and may come in handy on this important football weekend in Alabama. Out in Utah, we call 'em Funeral Potatoes. Serve them every time someone dies. It's always a little creepy feeling to get gastronomically excited whenever I start putting on a tie. Love this! Creamy, crispy, and delicious. Oh my gosh, YUM! How do you stay so thin? Since I found you, you are getting me fat!! We call them party potatoes and I love them so much that I look for any legitamate reason to make them. Such as my daughters Christmas potluck at Preschool. Even if the kids don't like them, the adults will. Hi! I am a fairly new cook so I have a question that might sound kinda dumb to you! When you freeze them do you just cover it with tin foil or do you cover them a special way so they don't get frost bite? Also, how long can they be in the freezer before going bad?? Steph I tried to pin this and it says "sorry, their is no image". Just thought you might want to know. I love all your recipes. Moy - I just tried to pin it and it let me. It must have been a glitch from Pinterest. Hi, I have a question. In the ingredients listing it says melted butter, but in the directions it says dot with cubed butter? Can you clarify? Thanks! Lisa - either way will work. If I am lazy, I just dot the butter on the cornflakes. If I am not lazy, I'll melt the butter and combine it with the cornflakes. This is the basic recipe I have been using but the last few times I have replaced one on the soups with cheddar cheese soup. It just gives it a more cheesy flavor. If I have any precooked bacon or sliced scallions laying around, I have also thrown them in! We make these and have started putting French-fried onions on top instead of corn flakes because my dad is allergic to corn. I think they're even better with the onions! Connie - what a great idea. I have a pan in the freezer. I am going to top it with the fried onions. Thanks!! Stephanie you said you did in 3 8x8 pans but then u say 9x13 is the cooking shorter in the 8x8 pans boy when your a new cook like me i can really think of some crazy ?s to ask you hope you dont mind. I get you on my email could you email me as i just know i will never relocate this site. mkkiki - I cook them about the same time. The smaller pans take about 30-35 minutes. I usually bake them frozen for 45 minutes. ty Stephanie and may i comment on this is the first time i have seen a picture of you and you are beautiful. And your recipes are so delish i follow you on plain chicken all the time. Preheat oven 350°; spray 9" x 13" baking dish. In bowl, combine first 4 ingredients; mix well; pour and spread evenly into prepared dish. In same bowl, combine corn flakes and melted butter; mix well; sprinkle on top of potato mixture. I'm going to try this on Friday night. I LOVE french onion dip. I'm excited. Thanks for sharing! Pam - I did and it was wonderful!!! Posting it on the blog soon! It is our new favorite. I make this all the time with frosted flakes instead of cornflakes. Mix frosted flaked with melted butter then put on top and bake. The frosted flakes make this dish to die for!